Your purchase includes 2 high quality airless pump bottles (each 1 oz. fill size) including 2 pumps and 2 caps (please note there is no straw-as the airless pump does not use a straw). The airless pump uses an advanced technology to dispense its contents. Instead of the traditional style pump & straw which pushes air into the container to force product outward, the airless dispenser uses the concept of vacuum & piston. When the pump is pressed, a piston on the bottom of the container pushes the product upward and out of the top. This process avoids contaminating the product with air, while minimizing contamination and spoilage. You do need to initially fill your bottle to the top with the desired product to create the vacuum. If you un-screw the bottle cap after filling, you can re-create the air less vacuum pump by pumping several times. 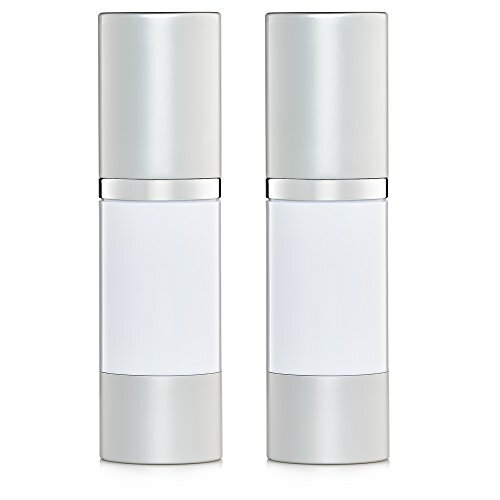 The 2 bottle set comes empty & ready for you to fill and re-fill with your favorite products for travel and for creating your own unique serums and treatment blends. They are perfect for any at home skin care, cosmetics, essential oils or DIY uses. The opaque white body is not only attractive, but also blocks out light. Thereby helping to prolong the effectiveness of essential oils, serums or other UV sensitive products. ✓Set of 2 bottles each 1 oz. (30ml) refillable high quality white opaque AIRLESS PUMP Bottles. Approved TSA Travel size. BPA free, sterile, shockproof & leak proof. ✓Beautiful opaque white body (non see through) designed to keep light out, preventing contamination and extending the shelf life of your products. Dispenses just the right amount with every pump to reduce waste. Uses air pump technology instead of a pump with a straw. ✓Perfect for foundation, serums, essential oil blends, liquid soaps & light lotions. Design the perfect homemade beauty gift. ✓Save money & treat yourself to custom creations by filling and refilling your empty airless pump bottles with homemade versions of your favorite products or store bought versions for a handy travel size. 100% satisfaction guarantee. If you have any questions about this product by JT Bottles, contact us by completing and submitting the form below. If you are looking for a specif part number, please include it with your message.